Is this the time for your room make over or you want to revamp the interior of your dream home? You may be a professional interior designer or a pleasure-seeking hobbyist who wants to play with the new furniture, room decors, walls and windows, latest design of doors and everything that could make the look more enchanting. Express your creativity, find inspiration and make smarter home design choices using simple drag and drop with the free interior design software tools. Internet connectivity has made them powerful with extensive catalogs available 24/7 , which are constantly being updated with the latest design of items. We have listed down some popular home designing tools. Auto Desk HomeStyler allows you to create your home designs in 3-D for free. It is an online tool and you can start visualizing your idea without even signing up or downloading any software. Still, it is a full-featured program with separate tools for floor planning and room decor. The catalog consists of a large collection of items and accessories that we keep in our houses. You are planning a living room? HomeStyler has got the sofas, sectionals, media units, tables and other living room stuff for you. You want to plan the floor layout? Yes, HomeStyler can help you plan it easily. Drag walls, doors, rooms and windows in seconds. You can view the home design in 2-D and 3-D. You may also use the premium brand products so that you can place the order directly, after finishing your design. Sign up for a free account and save your home designs online. Share it with family and friends. Roomle is an online tool for home interior designing. You need to signup before using the tool. Signing up is free. It helps the user with a tutorial video that describes how to use Roomle. It is a colorful, intuitive tool that helps you complete your design in minutes. As a registered user, you can save and share your designs. You may upload your sketches in the Roomle and it will suggest floor plans accordingly. The interface is user friendly and offers wall creators, detailed furniture and appliance placers. You can adjust the exact measurements of every item using the measurement tool. When you are done, click on the 3D view button to see a clearer picture of your designed room or home. 3D view is still in beta version. Place pad gives you entirely different way of designing the interior of your home. It is basically a sketching platform. Unlike other drag and drop tools, it asks you several details. For example, the number of bedrooms, living room, garage, doors or the number of floors are asked when you start creating a new place. Now, you can arrange all your rooms and accessories to come up with a basic layout. It is not over loaded with features. You may start using this software without any download or sign up. 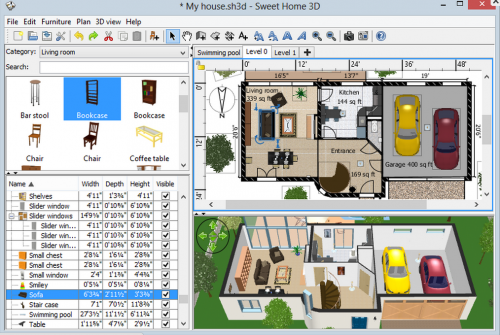 SweerHome 3D is another interior design software with online and download versions available. Note that your browser must have java script enabled to use this online tool. It may seem like a little less user friendly as compared to Auto Desk Home Styler. You can create the initial plan of your home, draw walls create doors and windows. You can specify the exact dimension of the objects so that it resembles the actual layout. Yes, you can add colors and place the accessories like chairs, tables, sofas and cupboards. Done with your design? Now, view it in the 3D mode and make any changes, if needed. pCon planner is a popular interior designing software with an interface similar to the ‘Ribbon’ in the Office suite. It is a professional and innovative work tool that has architectural functions. It can insert walls, doors, glass panels and stairs. You can import images from the Google 3D ware house. It is supported by extensive online catalogs so your creativity at peak, won’t be disappointed. This software is not online so you need to download it. It is compatible with the Windows XP/Vista/7/8. These are the most popular free ware available for home designing. If you are a professional interior designer or an architect, do use any of the above mentioned tool to ease your life.